Our analysis will focus on Mk 10:17-30. This section is linked with the preceding passage (10:13-16) and the following passage (10:23-34). We present at first, the preceding passage (10:13-16), then, our study section (10:17-31); the following passage (10:32-34) comes at the end. Reading all of these texts can help readers to understand Mk 10:17-31 in the context of the Gospel. 17 And as he was setting out on his journey, a man ran up and knelt before him, and asked him, "Good Teacher, what must I do to inherit eternal life?" 18 And Jesus said to him, "Why do you call me good? No one is good but God alone. 19 You know the commandments: 'Do not kill, Do not commit adultery, Do not steal, Do not bear false witness, Do not defraud, Honor your father and mother.'" 20 And he said to him, "Teacher, all these I have observed from my youth." 21 And Jesus looking upon him loved him, and said to him, "You lack one thing; go, sell what you have, and give to the poor, and you will have treasure in heaven; and come, follow me." 22 At that saying his countenance fell, and he went away sorrowful; for he had great possessions. 23 And Jesus looked around and said to his disciples, "How hard it will be for those who trust in riches to enter the kingdom of God!" 24 And the disciples were amazed at his words. But Jesus said to them again, "Children, how hard it is for those who trust in riches to enter the kingdom of God! 25 It is easier for a camel to go through the eye of a needle than for a rich man to enter the kingdom of God." 26 And they were exceedingly astonished, and said to him, "Then who can be saved?" 27 Jesus looked at them and said, "With men it is impossible, but not with God; for all things are possible with God." 28 Peter began to say to him, "Lo, we have left everything and followed you." 29 Jesus said, "Truly, I say to you, there is no one who has left house or brothers or sisters or mother or father or children or lands, for my sake and for the gospel, 30 who will not receive a hundredfold now in this time, houses and brothers and sisters and mothers and children and lands, with persecutions, and in the age to come eternal life. 31But many that are first will be last, and the last first." 32 And they were on the road, going up to Jerusalem, and Jesus was walking ahead of them; and they were amazed, and those who followed were afraid. And taking the twelve again, he began to tell them what was to happen to him, 33 saying, "Behold, we are going up to Jerusalem; and the Son of man will be delivered to the chief priests and the scribes, and they will condemn him to death, and deliver him to the Gentiles; 34 and they will mock him, and spit upon him, and scourge him, and kill him; and after three days he will rise." Mk 10:17-31 is placed in the context of Jesus’ teaching. This section 10:17-31 is preceded by the passage 10:13-16, in which Jesus connects “the children” with him and with the kingdom of God. He said to his disciples in 10:14b-15: “14b Let the children come to me, do not hinder them; for to such belongs the kingdom of God. 15 Truly, I say to you, whoever does not receive the kingdom of God like a child shall not enter it.” In our study section (10:17-31), Jesus calls his disciples “children” (10:24); he also indicates what people must do “to inherit eternal life” (10:17) or “to enter the kingdom of God” (10:23,24,25,27). From Mk 10:17-31 up to 10:32-34, we were told that Jesus and his disciples were on the road, going up to Jerusalem. On the way, Jesus revealed for the third time, his passion and resurrection. In 10:33-34, he said to his disciples: “33 Behold, we are going up to Jerusalem; and the Son of man will be delivered to the chief priests and the scribes, and they will condemn him to death, and deliver him to the Gentiles; 34 and they will mock him, and spit upon him, and scourge him, and kill him; and after three days he will rise” (10:33-34). The third prophecy of Jesus’ passion is linked to the preceding verses (10:17-31) by three ideas: (1) Detach oneself from possessions and then follow Jesus (10:21); (2) The theme of persecution in 10:30; (3) The saying “first will be last, and the last first” can be applied to Jesus’ passion and resurrection. The section of Mk 10:17-31 can be structured in three passages and one saying. The first passage (10:17-22) relates a man who wants to inherit eternal life. At first, this man seems to be a virtuous and pious man, because he has been observing ethical commandments (10:19) from his youth (10:20). But when Jesus advises him to sell all that he has, give them to the poor, then come and follow him (10:21), this man refuses to obey Jesus’ advice: “He went away sorrowful; for he had great possessions” (10:22). 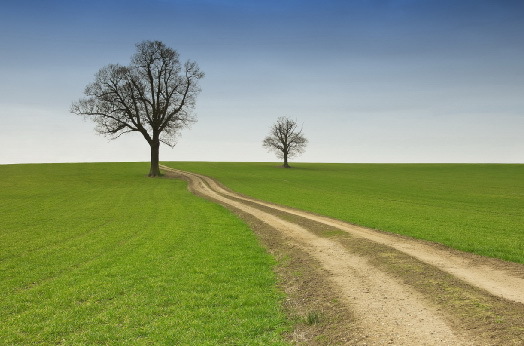 Thus possessions can become a big obstacle to discipleship. We will treat the themes “Possessions and discipleship” in the first point below. The second passage (10:23-27) is a private teaching of Jesus to disciples. The twice repeated idea is “How hard it is to enter the kingdom of God” (10:23.24). Jesus’ expression is emphasized with full of imagery. Jesus said: “It is easier for a camel to go through the eye of a needle than for a rich man to enter the kingdom of God” (10:25). It is difficult and then impossible for man, but it is possible for God (10:27). Why is the kingdom of God so hard to enter? We will talk about the subject “to inherit eternal life” or “to enter the kingdom of God” in the second point. In the third passage (10:28-30), Jesus promises to reward to those who have left everything and follow Jesus (10:28). The rewards for disciples are both in the present: “in this time” (10:30a) and future: “in the age to come” (10:30b). Why does the phrase “with persecutions” interrupt the smooth and positive flow of the narrative? We will analyze “the rewards of disciples” in the third point. The last verse of this section is a saying: “Many that are first will be last and the last first” (10:31) which describes a reversal. How can we interpret this quotation in the context of the narrative? Who is “first” and who is “last”? Those questions will be treated in the fourth point. We follow the progress of the narrative to analyze four following points: (1) Possessions and discipleship in 10:17-22; (2) Enter the kingdom of God in 10:23-27; (3) Rewards for disciples in 10:28-30; (4) The saying: “The first will be last and the last first” (10:31). The story begins with a man who called Jesus “Good Teacher” and who wants to know what he must do to inherit eternal life (10:17). In reply, Jesus talks about these two subjects. First, Jesus attributes the quality “Good” to God only. He said to this man: “Why do you call me good? No one is good but God alone” (10:18). The adjective “Good” applies to God in Jews’ tradition, it also applies to many other things (see Gen 1:4,10,12,18, etc.). Here Jesus recalled the central commandment in Dt 6:4-5: “4 Hear, O Israel: The LORD our God is one LORD, 5 and you shall love the LORD your God with all your heart, and with all your soul, and with all your might.” As J. Marcus points out, this first commandment “viewed by many early Jews and Christians as the functional equivalent of the first table of the Decalogue, which deals with relations between human and God. The second part of the answer (10:19) quotes from the second table of the Decalogue, which refers to relations between human beings” (J. MARCUS, Mark 8–16, 2009, p. 725). At the opening of dialogue, Jesus repudiates the virtue “good” for himself and directs it to God, the source of all goodness who alone can grant the gift of eternal life. By this remark, Jesus orients the man toward God, because first of all, “to inherit eternal life” or “to enter the kingdom of God” is a gift of God. The commandments which this man observed are presented in the first part of the narrative (10:19-20). Only at the end of the story, readers know that this man “had great possessions” (10:22). In the beginning the man is presented as a good and pious man, because he has observed the second table of the Decalogue since his youth,: “Do not kill, Do not commit adultery, Do not steal, Do not bear false witness, Do not defraud, Honor your father and mother” (10:19). In this list of commandments, Jesus changes the place of the fifth commandment: “Honor your father and mother” in the list of Decalogue in Ex 20:12-16 and Dt 5:16-20, so that the order of the commandments cited in Mk 10:19 is 6, 7, 8, 9, 10, 5. However, keeping well the commandments is not yet enough to inherit eternal life. Jesus said to him: “You lack one thing” (10:21). This lack suggests that the observation of this man is not complete, it needs something more “to inherit eternal life”. Ironically, this man who has everything (piety and great possessions) still lacks one indispensable thing. What is it? Jesus advises this man to do what he still doesn’t do, i.e., “Go, sell what you have, and give to the poor, and you will have treasure in heaven; and come, follow me” (10:21b). There are two steps in this order: to GO and to COME. The process of “go, sell what you have, and give to the poor” (10:21a) will relieve him of all his possessions, still he “will have treasure in heaven” (10:21b). This means that he will become a rich man again, but his treasure is in heaven not in this world. The change of place of his “possessions”, from “on earth” to “in heaven”, gives the man liberty, if he detaches himself from all that he owns then he can come and follow Jesus (10:21c). In the Old Testament, wealth and material goods are considered a sign of God’s favor (see Jb 1:10; Ps 128 ; Is 3:10). A pious man was expected to prosper and then to serve as a benefactor to those in need (see Job 1:1-5; 29:1-25). In general, a benefactor would earn gratitude from his/her beneficiaries and a good reputation from society. In the case of Mk 10:21, Jesus does not demand the man to become a benefactor, he is asking the man to divest himself of all his goods once and for all, and so deprive himself of the role of benefactor. The man had to choose between holding on to his possessions or joining in Jesus’ movement as a disciple. Jesus invites this man to follow him in an itinerant lifestyle, which must not be encumbered by worldly belongings. Unfortunately, the desire to retain his possessions made impossible for this man to follow Jesus and to become his disciple. The attachment to goods become an obstacle when thought and energy given to accumulating and preserving material assets and distract one from focusing on the kingdom of God. Since wealth and power generate false security, Jesus rejects them utterly as one of the conditions to enter the kingdom of God. From a literary point of view, the rapid movement full of enthusiasm and ardent quest of the man to sadness and resentment is a marvel of narrative art in the Gospel of Mark. The structure indicates three parts of 10:23-27. The first one (10:23-24) describes the difficulty for rich man (10:23) and for all (10:24b) to enter the kingdom of God. The translation of 10:24b in Revised Standard Version - Second Catholic Edition, 2006 (RSV-SCE) is “Children, how hard it is for those who trust in riches to enter the kingdom of God!” The clause “for those who trust in riches” is presented in some Greek manuscripts, but it is omitted in some other important Greek manuscripts. We follow the text of Nestle-Aland, Novum Testamentum Graece, (27th Revised Edition), Stuttgart, Deutsche Bibelgesellschaft, 1996: “Children, how hard it is to enter the kingdom of God” (10:24b). In this case, Jesus does not only repeat the sentence in 10:23: “How hard it will be for those who trust in riches to enter the kingdom of God”, but also he expands this declaration to all people: “How hard it is to enter the kingdom of God” (10:24b). The second part of 10:23-27 is a saying in which Jesus describes impossibility for a rich man to enter the kingdom of God by using images of “camel” and “eye of a needle”. Jesus said to his disciples: “It is easier for a camel to go through the eye of a needle than for a rich man to enter the kingdom of God” (10:25). The camel which is the largest animal of Palestine is proverbial for its full size, while the needle’s eye is proverbial for its smallness. Surprised by the obvious exaggeration between “a camel” and “the eye of a needle”, some manuscripts represent an effort to reduce the contrast, to make the impossible becomes “a little bit” possible by substituting Greek word “kamilon” (rope) with “kamêlon” (camel). Another explanation is there was an “Eye of the Needle Gate” in Jerusalem, but according to J. R. Donahue and D. J. Harrington, “The idea that there was an ‘Eye of the Needle Gate’ or ‘Camel’s Gate’ in Jerusalem has no historical foundation and again serves only to blunt the hyperbole” (J. R. DONAHUE; D. J. HARRINGTON, Gospel of Mark, 2002, p. 304). As P. Minear said, these explanations “dwarf the camel and expand the needle’s eye” (P. MINEAR, “Needle’s eye”, p. 169). In fact, the obvious implication of this pointed saying (10:25) is that: It is impossible for the rich to enter the kingdom of God. J. Marcus links the camel with the possessions of rich people: “The already impossible task of a large animal getting through the eye of a needle is made even more absurd when the animal is loaded down with possessions” (J. MARCUS, Mark 8–16, 2009, p. 731). Confronted with the context of impossible thing, the disciples were exceedingly astonished, and said to Jesus: “Then who can be saved?” (10:26b). In this question, the disciples expanded the impossibility for all. Before the impossibility for human beings to enter the kingdom of God, the positive response of Jesus is that “With men it is impossible, but not with God; for all things are possible with God” (10:27). Primarily, “to enter the kingdom of God” is a gift of God. Indeed, just before our episode (10:17-31), Jesus talked to his disciples about the children and the kingdom of God in 10:14b-15: “14b Let the children come to me, do not hinder them; for to such belongs the kingdom of God. 15 Truly, I say to you, whoever does not receive the kingdom of God like a child shall not enter it.” It means human beings can simply enter the kingdom of God by receiving it as a gift of God. 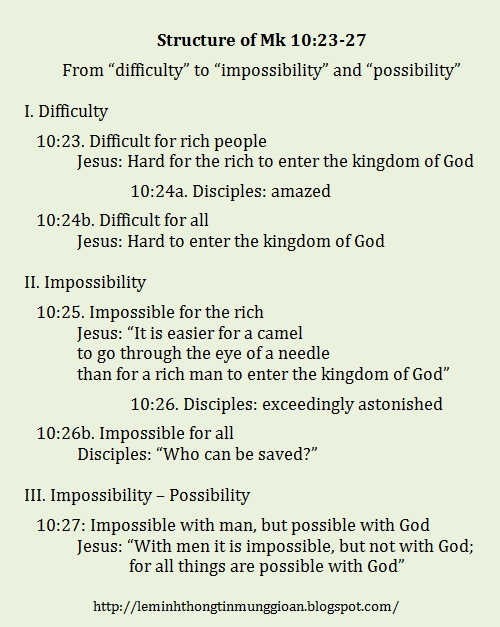 Before the difficulty and then impossibility for all human beings to enter the kingdom of God, the solution is that “all things are possible with God” (10:27b). The power of God and the gift of God are linked with the previous passage (10:17-22) about what humans must do to inherit eternal life (10:17b). In other way, everyone can enter the kingdom of God if they detach themselves from their possessions, come to Jesus, follow him, become his disciples, keep Jesus’ commandments and open their hearts to receive the gift of God. In the next passage, the tone is somewhat more optimistic about human side. In fact, the disciples leave everything but they lose nothing, they even receive a hundredfold. The saying of Peter to Jesus: “Lo, we have left everything and followed you” (10:28) contrasts with the decision of the man in 10:21-22; indeed, after Jesus advised this man to leave his possessions and follow him, “he went away sorrowful” (10:22). This man refuses to become Jesus’ disciple because he does not want to leave everything to follow Jesus. (2) Why is there no parallel in 10:30 (element 5’) with the element “father” in 10:29 (element 5)? It is possible that God takes the earthly father’s place, because Jesus teaches the disciples to pray in 11:25: “Whenever you stand praying, forgive, if you have anything against any one; so that your Father also who is in heaven may forgive you your trespasses.” The Father who is in heaven is the Father of Jesus’ disciples. However, the paternal image can apply to Jesus himself. Indeed, the word “children” (tekna) appears twice in 10:30 (element 6) and 10:31 (element 6’), with the other words which describe household: brothers, sisters, mother, father. 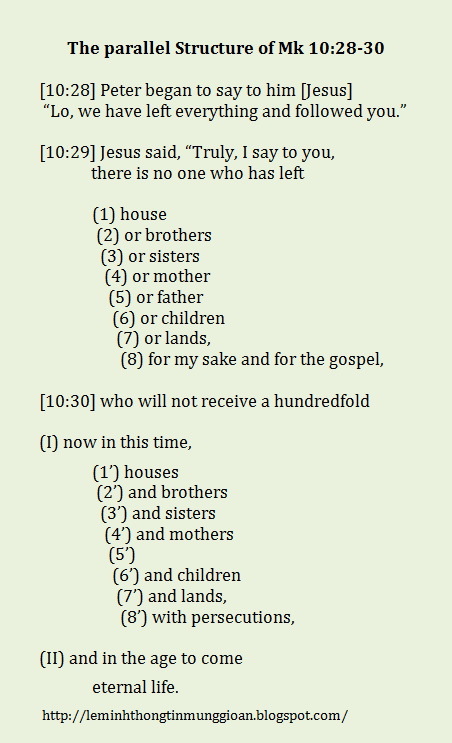 Strangely, Jesus uses the same title “children” (tekna) to call his disciples in 10:24. He said to them: “Children, how hard it is to enter the kingdom of God” (10:24). At the time the Gospel was composed, it is conceivable that Jesus himself functions as the father of disciples in the Markan community. (3) The phrase “with persecutions” (element 8’) interrupts the smooth and positive flow and occupies a place parallel to “for my sake and for the Gospel” (element 8). The disciples of Jesus can be persecuted for Jesus’ sake and for the Gospel. This difficult reality reminds the community that its participation in the kingdom of God in this world does not remove it from the mystery of the cross. For the disciples, the rewards “in this time” and “in the age to come” are fantastic, wonderful and no comparison; therefore they accept to sacrifice everything else, even their own life, if necessary, in order to inherit eternal life. (4) There is a striking contrast between overabundance of benefits promised for “this time” and the single reward guaranteed for “the age to come”, which implies that “the eternal life” is more valuable than all the advantages of “this time”. We can say the reward hundredfold “in this time” participates in the reward of eternal life “in the age to come”. In other words, “The list of benefits describes the inaugurated or anticipated aspects of the kingdom of God to be experienced already in the Christian community” (J. R. DONAHUE; D. J. HARRINGTON, Gospel of Mark, 2002, p. 305-306). The saying in 10:31: “But many that are first will be last, and the last first” gives the impression as an independent saying and it has no relation with its present context. But in fact, this saying has many interesting interpretations in the context of the narrative. The reversal of values in 10:31 can apply to rich people, to disciples, and even to Jesus. The word “many” in 10:31 shows that not all of them, who are “first” in the world, but “many” of them will find themselves “last” in the age to come. We can understand the first reversal in this general saying: “first become last” separated from the second reversal: “last become first”. We can also interpret this saying as a double reversal: “first become last”, “last become first”. (a) The first reversal: “first become last” in the context of narrative can apply to rich people or to disciples. For those with great possessions (10:22), who have tried to make themselves “first” by holding on to their property “in this time” (in this world), will find themselves “last” “in the age to come” (in the eschatological judgment). For the disciples, the rewards “in this time” (10:30) can be considered as wealth. The principle of “first become last” can be understood as a warning against arrogance in the disciples’ community. Some of disciples could tend to be short-sighted, and consider them as “first”. They will find themselves disqualified by the same principle of eschatological reversal and become “last” “in the age to come”. For example, when the disciples of Jesus discussed among themselves who was the greatest (9:34), that means they wanted to become “first”. Jesus taught them: “If any one would be first, he must be last of all and servant of all” (9:35b). Indeed, everyone, included the disciples of Jesus, can be tempted to become “first” in this world. (b) The second reversal: “last become first” in the context of 10:17-30 can apply to the situation of disciples. They have given up everything and have become “last”, in order to be first”. They become “first” in this world because they live in an already bountiful “family life” within the experienced Christian community. As disciples of Jesus, they become “first” in this time, in the age to come, and inherit eternal life. Jesus, who by rights is “the first”, the Son of God, become “the last of all” by his suffering and shameful death on the cross. Then “the last” will become “first”, the resurrection makes Jesus “the first of all”. The disciples of Jesus follow the same progression in situation of persecution. They become “the last” by following Jesus by the way of suffering life and death. Then they will experience eschatological power of the resurrection after physical death. The life of Jesus and his disciples point towards a double reversal: the first becomes last in order ultimately to become first again. This double reversal can also apply to everyone. Instead of becoming “first” by all kind of worldly possessions and hold on to the value of this world, Jesus proposes the reverse, that become “last” (in this world) and by following him, they will become “first” (in the world to come). 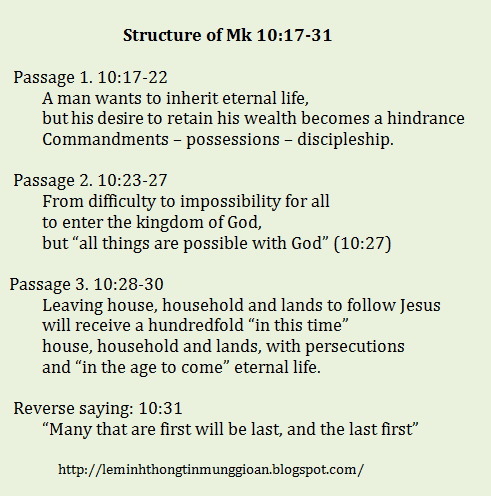 In the section of Mk 10:17-31, Jesus answers the question of the man: “What must I do to inherit eternal life?” (10:17) and includes the situation of the disciples who have left everything and followed Jesus (10:28). Jesus’ response is also for the readers nowadays. The story does not disparage the wealthy nor exalt the poor. Here Jesus does not encourage the man to share his possessions with the poor and become a benefactor, but Jesus demands that man “sell what he has and give to the poor” (10:21), just once and for all. For the twelve disciples, they left everything and followed Jesus. The choice is between “holding on to the possessions” and “coming and following Jesus” (10:22) in the case of the rich man; or between “holding on to everything” and “leaving everything and following Jesus” (10:28) in the case of the twelve. The high point of the story is the invitation to come and to follow Jesus; that means to become his disciple. Everything else that hinders one to engage in this discipleship must be secondary. In this perspective, “It is not a crime to be rich but only to trust in one’s riches (cf. 1 Tim 6:17)” (J. MARCUS, Mark 8–16, 2009, p. 730). Thus we can understand the sentence “those who trust in riches” (10:23) in many ways. People may “trust in riches” which include material possessions, great talent, power, merit and success. The idea “difficult and then impossible” for human beings to enter the kingdom of God reminds everyone that foremost the kingdom of God is a gift. People need to open their hearts to receive this gift of God and to follow the instruction of Jesus. Everyone who has the courage to give up everything and become a disciple of Jesus will receive a hundredfold now “in this time” and eternal life “in the age to come” (10:30). The rewards are so great; so disciples of Jesus accept to sacrifice everything, even their own life, if necessary, for Jesus’ sake and for the Gospel. That is the principle of this reverse saying: “First will be last, and the last first” (10:31)./. DONAHUE, J. R.; HARRINGTON, D. J., The Gospel of Mark, (Sacra Pagina 2), Collegeville (MN), The Liturgical Press, 2002, xv-488 p.
MANN, C. S., Mark, A New Translation With Introduction and Commentary, (Anchor Bible 27), New York (NY), Doubleday, 1986, xxvi-715 p.
MARCUS, J., Mark 8–16, A New Translation with Introduction and Commentary, (Anchor Yale Bible 27A), New Haven & London, Yale University Press, 2009, i-lx; 571-1182 p.